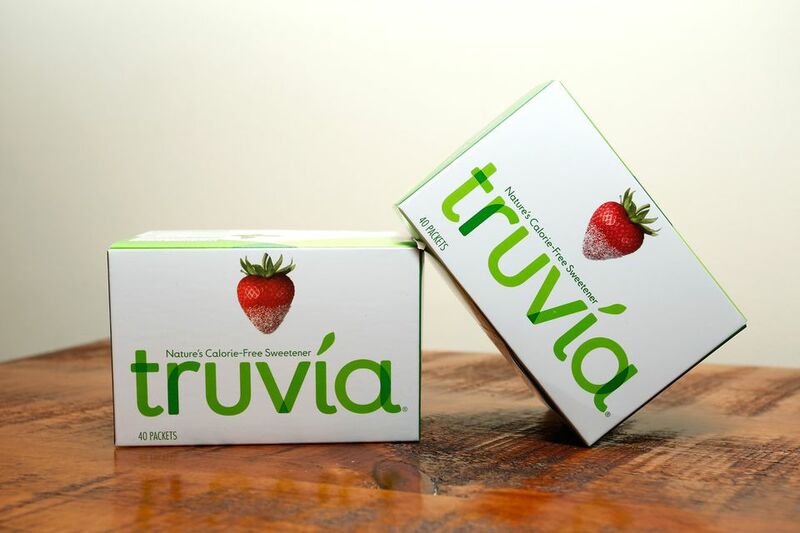 Most people have heard about the calorie-free sugar substitute called Truvia, which comes from the stevia leaf. It is one of the most popular sugar substitutes on the market. You probably know that you can use it in your morning coffee or sprinkle it over a grapefruit, but you may not know that you can use Truvia in baking. The catch is that it may require a little bit of calculation on your part. Either that or you can get the Truvia baking blend or Brown Sugar Blend, for either of these products, the sugar substitution calculation is done for you—for the most part. Unlike other sugar alternatives, Truvia cannot be used in baking as an equal swap; it cannot replace sugar cup-for-cup in baked goods. The manufacturer of Truvia says for best results, leave at least 1/4 cup of real sugar in your recipe. Real sugar plays an important role other than providing sweetness when you bake with it. Keeping some regular sugar in the recipe will help with browning, spreading, and lends to the overall structure of the finished baked good. After adding 1/4 cup of regular sugar to your recipe you can replace the remaining sugar with Truvia Natural Sweetener by using a chart for an easy conversion. The chart includes measurements for both Truvia packets and the spoonable version. Truvia's baking blend (rebranded as the Cane Sugar Blend) is made with a bit of natural sugar along with the Truvia, saving you 75 percent of the calories normally found in one serving of granulated sugar while maintaining the sweet flavor, texture, and color of your baked goods. It is important to note that the ratio of sugar to this blend is still not one-to-one. It's actually two-to-one. For example, if you need 1/2 cup of sugar for your cookies, you add just 1/4 cup of the baking blend. If you don't want to do the math, use the conversion chart when baking. Similar to the Cane Sugar Blend, the Brown Sugar Blend combines Truvia with brown sugar. It imparts the same sweetness, moisture, and texture as real brown sugar with 75 percent fewer calories per serving. As with the Cane Sugar Blend, the ratio of brown sugar to Brown Sugar Blend is two-to-one. Although the manufacturer says your baked good should turn out as if you used regular sugar, consider these tips in case your treats do not come out of the oven the way you had hoped. You can add about 1/4 to 1/2 teaspoon baking soda—especially to muffins and cakes—this will increase the baked good's volume and help in browning. Less sugar added means that you will lose bulk and the resulting batter will be less than if you had made the recipe with regular sugar. To compensate, you can use a smaller pan (such as an 8-inch cake pan in place of a 9-inch). Swap some or all of the butter or shortening for vegetable oil. If you use vegetable oil, you will increase bulk and decrease the amount of saturated fat.